1. Sadeas and Amaram are reunited on the battlefield in chapter 29. Clearly the two are perfectly well aware of each other’s characters – why do you think Amaram has made an appearance at this point in the story? Any thoughts on how he will affect the politics. Clearly Kaladin has good reason to hate him – but everybody else thinks he’s wonderful! That little chat between Sadeas and Amaram was interesting. After all, there was still a very small (tiny) chance that although Amaram had wronged Kaladin so badly he’d maybe done so for reasons as yet unexplained. Or maybe he wouldn’t be as bad as I thought. That’s no longer a possibility. I think that Sadeas probably uses Amaram almost like a spy. People obviously trust and respect him and seek his advice and yet he isn’t who everyone thinks. It seems that Adolin listens to his counsel. It will be interesting to see what happens if Dalinar begins to doubt Amaram. 2. Tyn – a rather short-lived character to say the least. Who do you think she was working for and what is their interest in finding the hidden city on the plains? Looking at the reveal regarding Tyn how did Shallan manage to call a Shardblade to her? I was also curious during this chapter about Shallan’s absent minded drawing – she thought a character she’s sketched looked like Yalb – what did you make of this, fanciful? 3. Kaladin’s dream and in particular the stormfather – what is the implication about humans and the spren, the betrayal, more to the point why the stormfather thinks Kaladin will murder Syl? Why did he warn Kaladin whilst at the same time calling him a little traitor?? Reading the short pieces at the start of each chapter – I’m thinking that spren are little pieces of a God? It certainly seems that belief is what makes them live and as has already been explained they seem to have a symbiotic relationship with the person they link to where both parties gain something. Perhaps when Kaladin achieves his full status he will no longer need Syl? Maybe she will simply wane if he no longer needs her? It did seem that the stormfather was helping Kaladin though and giving him a warning. I also thought it was interesting that the spren were aware of Szeth’s approach. Firstly, how does he manage to get around so easily in the middle of a highstorm, secondly although he doesn’t have a spren as such – maybe he has a spren inside him controlling him somehow? Basically I don’t know. 4. Finally Szeth makes an appearance and we find out who is actually on his hit list. Why? Why Dalinar and not the King? The other deaths all seem to be Kings and Highprinces. What did you make of Szeth’s confrontation with Kaladin – not only the fight but their conversation? That scene was fantastic. I literally couldn’t read it fast enough. The tension and excitement. I was so scared that Dalinar’s number was up! Not sure why the assassination attempt wasn’t for the king though – I’m beginning to wonder about the young King. Plus he seems to have rather quickly let Dalinar take charge and practically take over ruling, although in fairness I don’t blame him for that. The confrontation between Szeth and Kaladin was brilliant. It’s finally been made clear to Szeth that he’s not the only one and it clearly made him panic a little. I can’t figure out who the ‘they’ he talks about are. ‘They told me I was a liar!’, ‘They named me Truthless!’ Can’t wait to find out who exactly is behind all this. 5. Eshonai – finally succeeds in getting a message to Dalinar with a meeting set up. How do you think that’s going to play out now she’s released the captive spren – what do you think actually happened during that sequence?? Well unless Eshonai can somehow break free I don’t see this going too well. It appears that her body and will have been taken over because she seems to be contained within – how horrible. Whatever this ‘new’ entity/spren/whatever wants it seems to be a different agenda than the one originally envisaged. it could spell trouble with a Capital T.
6. Finally Shallan reaches the plains- what was your reaction to her first meeting with Dalinar and her second meeting with Kaladin? She’s chosen to stay with Brightlord Sebarial – what are your first instincts about Sebarial?? I can’t believe how much Shallan has changed. She’s still nervous deep inside but she’s playing the role to perfection. The meeting with Navani and Dalinar felt almost a little bit disappointing. Dalinar seemed dismissive and unimpressed and Navani, well, she was shocked about Jasnah so wasn’t really herself. Shallan’s second meeting with Kaladin was hilarious and almost electric – these two definitely have sparks between them whether they know it or not! It was interesting to see Adolin’s reaction – like a moth to a flame – he simply can’t resist a pretty face can he. Shallan also seemed to like him although how long his attention would stay on her remains to be seen – or remains until the next pretty faced stranger walks into the room! Brightlord Sebarial is a curious fellow. He’s one of those people who now he’s reached a certain age will jolly well say what he wants. Quite refreshing. I’m sure he’s no sucker though so it will be interesting to see the part he will play. The chapter where we were shown a little more of Shallan’s history. Her father was questioned by Jushu – Jushu asked for witnesses, lighteyed witnesses and he mentioned that there had already been one willing to speak the truth who was no longer available – could that be Shallan’s brother? Still hanging onto my, very slim, hope that Jasnah has pulled a fast one and is still alive somewhere! And, as you can see I think I’ve generated more questions than answers this week. 1) We have a new character on the scene: Zahel, a swordmaster. What do you think of his interest in Kaladin? It’s very curious isn’t it. I like Zahel. Maybe that’s because he wants to train Kaladin – and clearly he had a point as Kaladin very successfully displayed! Although, part of me wonders if part of Kaladin’s success is his improvisation. Anyway, I have mixed feelings – I like Zahel – but in a way it makes me sceptical because Kaladin’s first thoughts were to mistrust. Okay, sitting on the fence here. 2) We learned a bit more about Shallan’s past. What do you think her brother Heralan was doing all those years ago, coming and going as he did, and where did his Shardblade come from? Again, this was very interesting. Last week I was convinced Shallan hadn’t killed her mum, this week I’m mistrusting that initial thought. I thought she’d probably witnessed it. But, this week, she broke her silence to protect her dad which I wonder if she would have done that if he’d killed her mother? Surely she’d hate him as much as her brother seems to do. Perhaps he was protecting some sort of secret for Shallan. I have no idea why Heralan has a Shardblade – I only hope he knows how to use it! 3) What do you think of Shallan’s recent actions with the caravans? How about her growing friendship with Tyn? And her first interaction with Kaladin? I was really impressed with her this week. She took control of her situation and I think it was a learning curve for her. It was interesting to here Pattern say that there are different truths. Not sure what to make of Tyn yet, I like her to be honest. Yes, she’s a bit of a con artist, but, I think the two could get along – she’s also free thinking – I loved her comment about she’d eat what she wants – damn straight! She thinks she has Shallan sussed out and so she’s opening up in a way that she wouldn’t otherwise do. The first meeting between Kaladin and Shallan was so funny! It’s now got me thinking that those two would get on famously – I don’t think Adolin would take that well. 4) Kaladin took Syl’s advice and confided in Dalinar concerning Amaram. What do you think Dalinar will do with this information? Well, it will be good to watch this. Knowing what he now knows, if I was Dalinar I would sit back in the shadows and watch how Amaram reacts to Kaladin when he believes nobody is watching him. It seems to me that Amaram will either confront Kaladin or try to expose him in some bad way and Dalinar needs to keep a low profile and observe. Clearly he can’t just out and out believe one man’s word against the other although I thought he took the revelation well – he didn’t blow up at Kaladin and become all indignant or self righteous so it feels like he’s giving Kaladin the benefit of the doubt. 5) There has been yet another attempt on the King’s life. Do you think this is another faked attempt (as Ehlokar did with the saddle girth in Book 1)? If not, who do you think is the most likely culprit? I can’t imagine Ehlokar making another fake attempt. I’m a bit baffled to be honest. Plus it’s somebody with a Shardblade – although clearly people let others use their blades so that’s not a definite pointer. Because I dislike Sadeas so much I can’t help wondering if he’s behind it somehow – maybe pouring poison into somebody’s ear and allowing them the use of his blade. Basically I don’t know! And, the attempts seem too easy – like a distraction. 6) Gaz has returned to the story, after having mysteriously dropped out in Book 1. What do you think he isn’t telling Shallan? How do you think the men of Bridge 4 will react upon seeing him again? I don’t think the bridgemen will throw Gaz a welcome party, he was hardly nice to them after all! Obviously he had his gambling debts but it seems to me he must have done something worse somehow. It was curious to watch his reaction to Shallan, in one way he was admitting things almost in a resigned what difference will it make kind of way and then he just closed up. 7) Eshonai and Adolin had a brief chat on the Shattered Plains. What will come of it? How will the Parshendi ever get a messenger to Dalinar? I think it can be done and I really think Dalinar will want to have this conversation. How will they get a message through? Could one of the Parshendi who doesn’t have the armour perhaps sneak in as a parshman. Or, maybe, they could use a spren? ahhh – grasping at straws. 1. We learn a little more about Syl and her connection to Kaladin. There are more spren out there, ‘trying…to reclaim what was lost”. Yet Syl was forbidden to come and chose to do it anyway. What do you make of this new information? I think the spren naturally want to save people from whatever is coming. It sort of stands to reason in one respect. Without people the spren would cease to exist wouldn’t they? Well, maybe not cease to exist but it seems that there has to be some sort of conscious thought or action in order for them to appear. Plus, the ones that have attached themselves to humans seem to have a vested interest in helping them. 2. Chapter 10 is brief, yet intriguing – and kind of creepy! It looks like Shallan was responsible for her mother’s death, among others, when she was young. What are your thoughts on this scene? I’m enjoying finding out more about Shallan to be honest and I like the way that Sanderson slowly reveals these snippets of information. I’m not totally convinced about Shallan’s involvement. Part of me thinks it clearly looks like she was involved but then I have this fascination to the ‘lying’ or perhaps more kindly, ‘being selective with the truth’, element to her character. I suppose there’s a few scenarios – at least – was Shallan a witness to something horrible and lied to cover up the fact that she’d seen anything? Did she imply that she was involved – and was that truth or not? Or did she actually just murder her mother (and others). Partly I don’t want to believe that she would be capable of that. I didn’t initially like Shallan – simply because she intended to steal from Jasnah, but whether or not I think that was misguided she was doing this for what she believed to be the right reasons. I don’t think she’s a malicious character at all but she’s clearly intelligent and capable of quick thinking so maybe she said what she needed at the time in order to protect herself. 3. Highlord Amaram is back, and still has Kaladin’s Shardblade. He also seems to be close friends with Dalinar. Do you think Kaladin will tell Dalinar what happened between them? If so, what do you think might happen? This is a very tricky situation and could certainly lead to a revelation about his hidden strengths – which is exactly what Kaladin fears. Plus this is coming at a time when he already doubts himself and still thinks everything will still be taken from him. Obviously they’re going to meet up eventually given Kaladin’s new role and Amaram will undoubtedly recognise Kaladin. The fact that there is only Kaladin still alive will mean this is going to test Dalinar’s faith in him. I really can’t think what will happen with this one! Total wimp out!! We get an Interlude with one of the Parshendi – the Shardbearer who fought Dalinar, a woman called Eshonai. We finally get a real look at the Parshendi and learn more about what they’re doing on the Shattered Plains. What are your thoughts on this? We also learn that Eshonai wants to speak with Dalinar and sue for peace. Do you think that’s likely to happen? I thought it was brilliant getting the POV of the Parshendi. They seem to fear whatever trouble is coming as much as everyone else. I was totally gobsmacked about their very casual confirmation about Gavilar’s death. I genuinely didn’t see that one coming! Sanderson does it again – just when you think you’re starting to get to grips with what’s going on he throws a blinder and totally knocks you off. It was also kind of sad that they’re becoming so depleted. I don’t know, it made me see it from the other side I suppose. All along the Parshendi have been the enemy in the story – and maybe they are – but if that’s the case they seem to have forgotten just as much as everyone else over the years. Reading this Interlude made them seem, well, like everyone else – I can’t just mindlessly dislike them now! Yes they killed Gavilar – and I’m racking my brains to think of what his scheme was and how it relates to uniting everyone. I kind of wondered if Gavilar was having the same visions as Dalinar is now having and maybe he thought he had to unite the Parshendi. Anyway, time will tell. I think if anyone would be likely to listen to the Parshendi it would be Dalinar. He did love his brother and I think it would need some sort of explanation – not that that makes everything hunky dory, but, maybe the two sides do need to team up to face whatever is coming? Adolin’s first duel doesn’t exactly go as anyone expected… What did you make of how it was won? Do you think it will force people to take Adolin, and by extension Dalinar, more seriously? It will be interesting to see what Dalinar makes of Adolin’s tactics – what with his codes, etc. I can’t help applauding Adolin to be honest. They’re in desperate times, the clock is ticking and the Alethi highprinces are a bit of a joke really! Something needs to shake them out of their reverie – whether that will be it remains to be seen but Adolin’s tactics certainly caught their attention. He won’t get away with that a second time as there will be no element of surprise. And, yes, I think it will make people sit up and take notice. Such a lot happened this week! Shallan and her ‘is she or isn’t she in a very tricky situation?? It was interesting to read Adolin’s thoughts – he seems to be looking forward to meeting her. Also the chapter with the shoemaker – not sure of the relevance of that particular chapter just yet – very intrigued to find out who it was who killed the shoemaker at the end. I was also interested in the lullaby that Shallan’s father was humming to her after the murder chapter! ‘Now go to sleep in chasms deep, with darkness all around you. Though rock and dread may be your bed, so sleep my baby dear. Now comes the story, but you’ll be warm, the wind will rock your basket. The crystals fine will glow sublime, so sleep my baby dear.’ What on earth does that all mean. Yes, I don’t know – but ‘a problem shared’ and all that!! 1. We basically get the same prologue from the first book except from Jasnah’s POV. She tells Gangnah that her father’s assassin walked on the wall, and it’s ignored. We also see the Parshman leaders immediately take credit for the assassin. What did you make of it all? Insights? Impressions? How will this affect the story going forward? I thought this was really quite eye opening – it certainly gives the reader a good idea of why Jasnah is so determined to find out about the Parshmen and Szeth. It’s also interesting that Jasnah’s assertion that Szeth walked on the wall was basically ignored. These people really have forgotten all about binding! 2. Andolin and Shallan are unofficially engaged. How do you see this relationship panning out? I have a good feeling about this (so no doubt it’ll all go pear shaped). I think that Andolin and Shallan could be really good for each other. Andolin needs something to ground him a little and I think Shallan will do just that. Also, he concentrates a lot on running around in fairly fickle company with a constantly changing string of partners – although, that being said, I like him and I think he’s changed already since the beginning of the story. He had a shock about his father and has seen the right in that scenario. By the same token Shallan hasn’t always been the most straightforward of characters. I didn’t really like it when she went to work for Jasnah just in order to steal from her. But, again, I have come to like her and I think the two of them could become a winning team. 3. Kaladin wants to keep his Radiant powers a secret for as long as possible. How successful do you think he’ll be? How long will he remain hidden? Do you think he’ll succeed in training the thousand? I think that Kaladin will succeed at everything! Of course I’m having a tiny little Kaladin crush so I could be slightly biased. I don’t blame him for wanting to keep his powers secret – once word of that gets out it will be ‘a big thing’. People don’t seem to realise that there’s already Szeth out there with similar powers so Kaladin could almost be looked upon as the ‘first’ one since the Radiants. It could turn into one of those really terrible moments where everyone chases you out of town with pitchforks and torches or he could be put on a pedestal – neither would be really helpful. Plus, he’s got rather a terrible history of everything being taken from him to date so it’s no surprise that he wants to hold onto this. 4. Jasnah thinks Shallan’s spren is a Cryptic, as opposed to an Honorspren which is what Syl is. What do you think is the significance of this? What does it mean for Shallan? For Kaladin? I love this whole spren thing. It’s just so intriguing and it kind of makes sense that Shallan’s spren is different. I like the idea of a cryptic spren. This spren seems to see things in a different way, nothing is simply straightforward. Although, there is all this talk of one spren thinking that the other spren have been dishonourable so you can’t help thinking that maybe Syl will not like this cryptic spren? Like maybe the cryptic spren have given something away? There was mention by Shallan’s spren of something along the line ‘no lies without truth’, or, I don’t think I’ve phrased that very well, but I think the spren was trying to say if you have one you have the other. Maybe the cryptic spren think that truth is all a matter of perspective. I also wondered why certain types of spren attach themselves to certain types of people? Like Syl being a Honorspren attached to Kaladin – who, as we know is full of honour. Did Shallan attract this Cryptic spren for a reason – she was after all planning on stealing from Jasnah and did tell a few lies along the way, although she had her own justifications?? 5. How will Kaladin accomplish all of the tasks Dalinar has laid on him? Do you think Dalinar’s plan with the duels will work to stave off civil war and help unite the high princes? 6. After the incident with the ship, do you think Jasnah is truly dead? Predictions? I don’t think she’s dead and I hope that I’m right. There seemed such a lack of detail – it feels somehow like a foil. I don’t know how and I’m probably wrong but I’m thinking that maybe Jasnah had somehow conjured that scene. I’m probably off with the detail but to kill off Jasnah at this point, for no particular reason or moving on of the plot, seems very unSandersonlike. 7. What are your first thoughts/impressions of Pattern? How do you see his and Shallan’s relationship developing? I can’t dislike Pattern. It’s a bit like when Shallan first started to draw and then see the cryptics – I just didn’t think they were threatening. I also think it’s interesting that Jasnah thinks the cryptics have driven Shallan to seek her out and train her. If they were really bad wouldn’t they try and keep her away from any other influences. Perhaps they want to help. I don’t know!! Looking forward to everyone’s comments which will no doubt put me back on the right track! Don’t forget to stop over all the others. It’s here. You’ve waited. You’ve been patient. And now, it’s arrived. 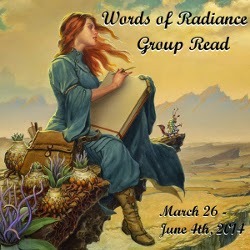 THE readalong of Brandon Sanderson’s Words of Radiance is finally here. It’s grand, it’s epic, dare I say, monumental! So, what are you waiting for? You know you want to read this and you know you want to read it in good company with a load of other people who will bend your ear about the finer detail, argue, debate, discuss, speculate, etc, etc. If I’m wrong then I’m wrong! But, you know I’m right. Check out the details of this readalong hosted by Dab of Darkness and Stainless Steel Droppings and sign yourself up (starting beginning of April). Seriously, this is a fairly relaxed readalong with a nice gentle pace (which of course doesn’t prohibit you from racing ahead) that gives you the chance to fit other things into your busy schedule. If you want to join on board then pop over to one of the sites above and sign in blood on the dotted line (actually kidding about the dotted line!) (okay, and kidding about the blood). Join up if you want to have immenseness – because it is going to be immense, epically immense.